It’s normal to grill chicken, or even croutons for a salad, but lettuce? On the grill? You bet. 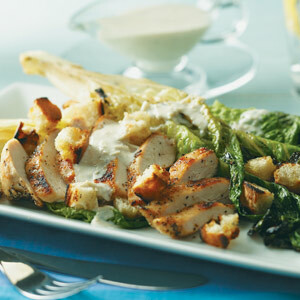 Step out of your salad comfort zone with grilled romaine and buttermilk Caesar dressing! Anchovy paste is a good substitute for real anchovies, but you can also leave the anchovies out of the mix completely. The dressing will still be excellent. Preheat grill to medium-high heat. Brush grill rack with oil. Combine 1/2 cup Asiago cheese, sour cream, anchovy paste, vinegar, Worcestershire sauce, garlic, dry mustard, salt, and pepper for the dressing in a small bowl. Whisk buttermilk into ingredients until smooth; cover and chill. Brush both sides of bread and cut sides of romaine with oil; season with salt and pepper. Grill bread 2 minutes per side. Grill romaine until edges char and outer leaves wilt slightly and turn a deep, bright green, about 2 minutes per side. Rub one side of toasted bread slices with cut side of garlic clove, then cut bread into large cubes. To assemble, cut romaine in half again lengthwise, then arrange two quarters on each of four serving plates. Top salads with sliced chicken, croutons, and dressing. Garnish with Asiago. Whisk buttermilk into the ingredients for the dressing. It provides a thick consistency and tangy flavor. Rinse the romaine, then remove any wilted outer leaves from the heads and slice them in half lengthwise. Grill the romaine halves, cut sides down, until the edges begin to char. Turn romaine and grill the other sides.